We proudly present to you, our fine Power Animal and Magical Creatures Jewellery. Animals are our companions, allies, teachers, totems, guardians, spirit messengers and younger siblings. Honour your personal relationship to animals and nature. Open your heart to their magic and wonder that reflects their natural spirit and calls upon their power and medicine. 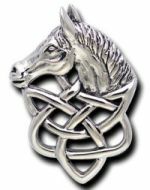 Represents 'Power' - Horse manifests true understanding of personal power and what it means for the individual. Personal power was given to us to be shared with the awareness that to share our power and to teach others how to discover their own concept of power will ensure our life more fruitful. Horse promotes passion from within - the power to bring about movement and avoidance of stagnation in all aspects of our life. A solid and sturdy piece featuring beautiful celtic knotwork. The Silver bail for your chain is hidden behind this pendant. Represents 'Deception' - Having powerful night vision, the Owl warns us of deception and not to assume that all is well all of the time. People and situations we trust may not be always completely trustworthy. Owl offers us the gift to be undeceived by external appearances and to silently discover the truth hidden beneath them. A solid and sturdy piece. Nice detailed feathers. Represents 'Magic' - Raven offers the strength to explore the Void, the creative darkness of all that is yet to be. Raven is a shape shifter, capable of teaching us the art of adaption. 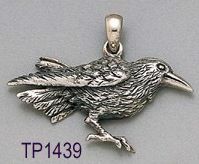 Raven can show us the best way to shift our consciousness so that we may blend into any new environment or situation. A solid and sturdy piece. Nice detail. Represents 'Illusion' - Dragonfly helps us to change our view of life and to realize that althought it is easier to stick with what we know and trust, to break through that illusion of life often means growth and development on levels once thought impossible. 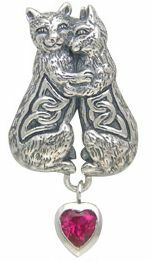 A small pendant also suitable as a charm or add to ritual tools. Features Black Onyx or Malachite Stone inlay in the tail. Matching Ear Rings Available - Please Enquire. Represents Transformation - The Anglo-Saxon word "dragon" is derived from the Greek word meaning "to see clearly". The Celts believed dragons had the gift of vision, wisdom, and prophecy. Dragons were considered the guardians of all knowledge and wisdom. Celtic tradition gives specific qualities for dragons - elements of earth, air, fire and water. In general terms, Dragon's power is that of shedding its skin and emerging as a new, transformed being. 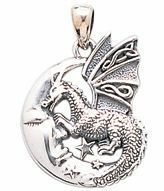 Dragon with moon and stars pendant. A solid and sturdy piece. Nice celtic knotwork detail on the dragon wings. Represents 'Transmutation' - Snake teaches us to discard all outgrown values and belief systems. Just as it sheds its old skin, Snake suggests that we can cast off all encumbrances and outmoded ways of thinking, thus rejecting characteristics that restrict our growth and development. Snake assists in the harnessing of qualities that help us to transmute ourselves to higher levels, while simultaneously assisting our healing and the realization of symbolic rebirth concepts. 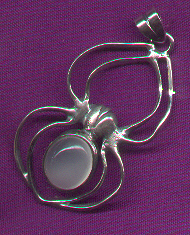 An unusual 3-dimensional pendant. 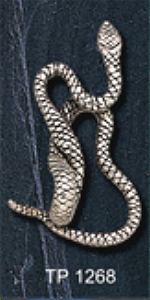 The thicker coil on the snake forms the bail for your chain, the snakes head would be facing downwards. You can also wear this pendant in different ways by threading your chain through one of the other snake coils. This pendant sits flat with a raised coil so it can be added to magickal tools or to decorate your space. Represents 'Protection' - Powerfully sensual, self confident and often 'aloof', the Cat offers protection, independence, psychic power, sensuality and self confidence. Cats combine a high degree of sensuality with a deeply psychic and spiritual nature which reminds us that the physical and spiritual worlds are not seperate, but one. Traditionally seen as the archetypical witch's familiar, cats are a magnificent aid to grounding, and just stroking their fur can bring calm, healing and a sense of peace. 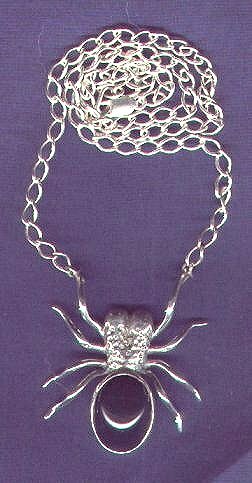 This is a fine pendant and chain set for yourself or a gift! 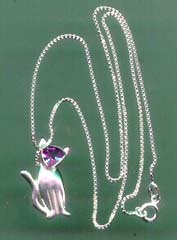 The gorgious triangle trillion cut natural Amethyst stone forms the face of this stunning Cat pendant. Comes with a Silver box cut chain. A solid and sturdy piece featuring beautiful celtic knotwork. The Silver bail for your chain is hidden behind this pendant. Available with Red Ruby Heart. 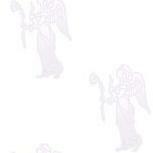 Note: Right image example, shows dangling Heart with Pink Shell. 'Weaver of Dreams' - Just as the spider reweaves her damaged web, we too can reweave the web we call life whenever we like. As long as the web is strong enough to harness our dreams, the power to change direction whenever the need arises remains ours, without question. 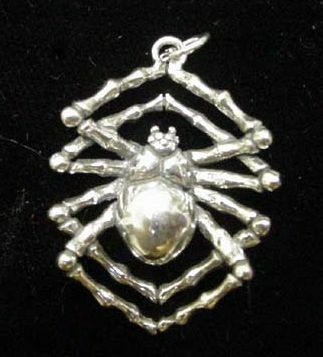 This is a fully detailed, Sterling Silver Spider Pendant. The under side is detailed and life like. Extremely high quality and well made. of ShadowSmith Jewellery, sizes will vary to illustrations. Extremely beautiful and life like. 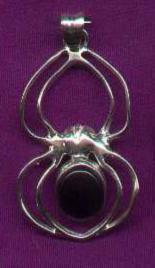 A large cabochon cut stone forms the body of this hand crafted sterling silver Spider pendant on sterling silver chain. The chain is attached to spider's two front legs. 40mm total dia of legs span. 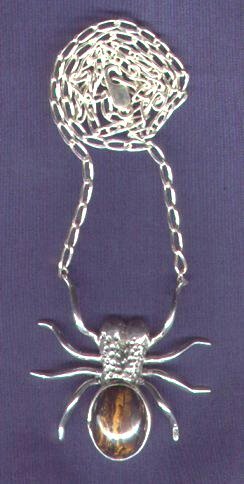 This sterling silver hand-crafted Spider pendant is set with a cabochon-cut stone, which forms the abdomen of the spider, a slightly tear-drop-shaped oval, around which the legs of the Spider come together in a point, top and bottom, forming a graceful figure-8. 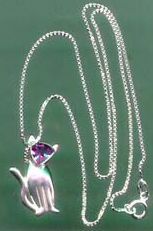 The bail of the pendant is sterling silver, designed to allow the pendant to lie flat against the body, parallel to the supporting chain. 20mm x 15mm size Black Opal Potch stone. A large cabochon cut Tiger Iron is the perfect stone for this hand crafted sterling silver Spider pendant on sterling silver chain. The hand made velvet lined box features a pentagram in copper and brass with a copper inlaid timber knob on the lid. 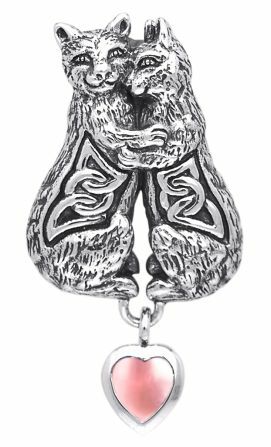 Unless noted otherwise, all pendants are solid Sterling Silver and come in a suedette drawstring pouch. Please enquire for Solid Gold and Gold Plate on Sterling Silver.